American Wholesale Property: Turnkey in Houston! Needs only minor cosmetic updating! Turnkey in Houston! Needs only minor cosmetic updating! Here is a great rental opportunity in the Spring area. Property was Built in 2005 and has recently seen upgrades to the flooring thru out. This thing just needs a quick clean to be rent ready. Property was rented for $1100 per month (2nd comp). A cash buyer can expect a 14% ROI on this one!! 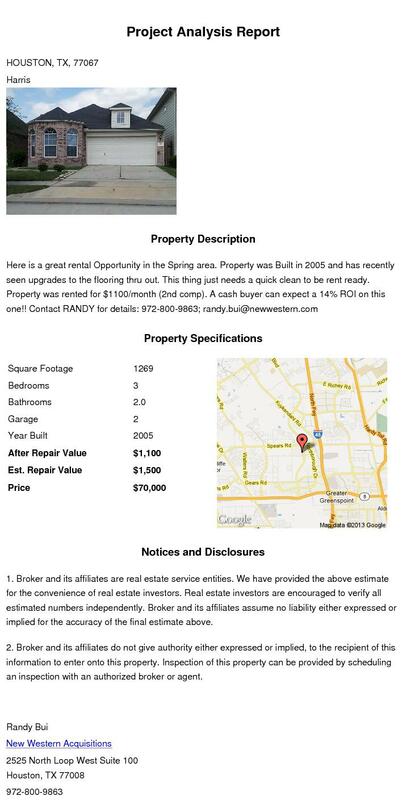 For more details, contact RANDY BUI at randy.bui@newwestern.com; 972-800-9863.